With the 2007 DCI World Championship television program rebroadcast on ESPNU tonight at 6 p.m. ET, DCI.org takes a look back at some of the faithful drum corps members and fans who gathered together to watch the premiere of the broadcast back in September. In keeping with our yearly tradition, the drum corps members of Butler University in Indianapolis got together on Sept. 5 to watch the DCI World Championship broadcast on ESPN2. 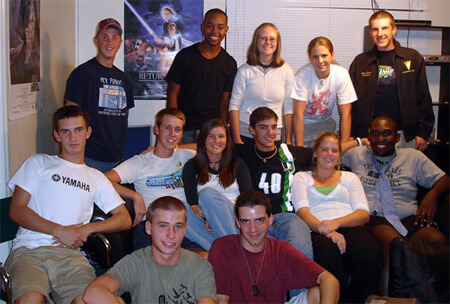 Back row from left: Josh Scott (Phantom Regiment visual staff), Evan VanDoren (Carolina Crown drum major), Chad Brinkman (Carolina Crown horn sergeant), Chris Hodgson (Troopers), Eric Weingartner (The Academy), and Christina Lear (Troopers). Front row from left: Bryan Byrer (Bluecoats), Caitlin Smith (Carolina Crown), Sam Bivens (The Cavaliers) and me, Emily Fetcho (Phantom Regiment). As always, much fun was had by all. Thanks to our non-drum corps marching friends who tolerate our madness—especially our personal photographer, Hannah Rademacher. Blue Stars and Velvet Knights alum Oniel Mercure submitted this photo. This photo is from our party on Sept. 5 at Brooklyn's in downtown Denver. Represented were current and past members or instructors of Chops, Inc., Minnesota Brass, High Country Brass, Madison Scouts, Blue Devils, Santa Clara Vanguard, Troopers, Blue Knights, Blue Stars and Velvet Knights. Daryl Thompson, a 2007 member of the Cavaliers, sent this photo. Hello, this is a photo of the Florida State University group who watched the DCI World Championship broadcast on ESPN2 on Sept. 5. We had a great time watching the broadcast and reliving some great memories from this past summer! 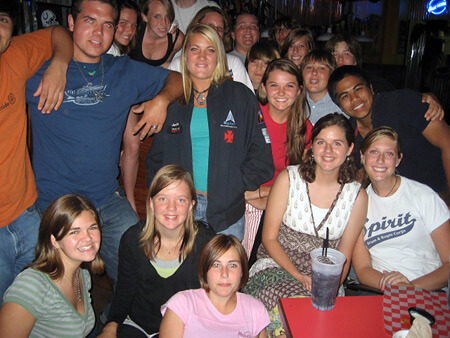 All of the following were drum corps members in 2007! Top from left: Angelo Outlaw Jr. (Crossmen front ensemble), Michelle Guest (Spirit from JSU mellophone), Jenn Mammino (Boston Crusaders mellophone), Matt Shaud (Glassmen mellophone). Middle from left: Ben Holsworth (Cavaliers trumpet), Daniel Orban (Cavaliers mellophone), Lauren Cobb (Spirit from JSU Mellophone), Tim Brown (Cavaliers trumpet), Jenn Petersen (Spirit from JSU baritone), me, Daryl Thompson (Cavaliers color guard). Bottom from left: Kels Devine (Phantom Regiment mellophone), John Brown (Phantom Regiment euphonium). Jennifer McGee submitted this photo. Center of photo is Spirit from JSU member Jenetta McGee surrounded by her hometown marching band members of the South Walton High School Seahawks. 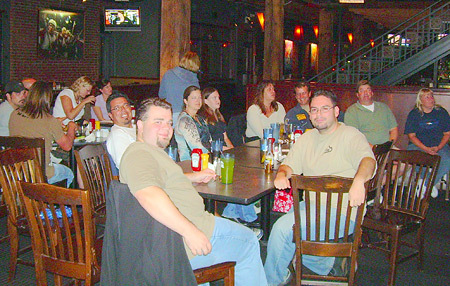 They all had a great time watching the 2007 World Championship broadcast on ESPN2 at Buffalo Jack's in Destin, Fla.